ed. with Daniel Sanjiv Roberts; London: Routledge, 2008. “Roberts’s, Morrison’s, North’s and Rzepak’s contributions are outstanding, as is the generally high level of research displayed in this book.” – Markus Iseli, Romanticism, 17.3 (2011), 365-67. 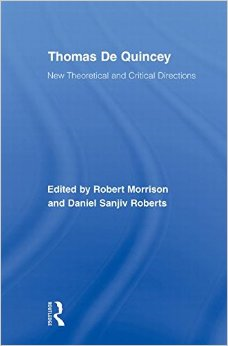 “De Quincey’s critical fortunes are booming, witnessed by at least ten book-length studies of his writing since the 1980s, among them a 2000 study by Daniel Sanjiv Roberts and a new biography by Robert Morrison, who have now co-edited this excellent volume….The essays in this volume exemplify how De Quincey’s writings make past, present and future at once ruinously – and vitally – present to us.” – Joel Faflak, The Byron Journal, 38.1 (2010), 84-87.